In 2012, the Center for Medicare and Medicaid Innovation (CMMI) launched an ambitious demonstration initiative designed to transform the health care system at the state level by building new, scalable models. The federal goal of the State Innovation Model(SIM) is to improve care and lower costs for Medicare, Medicaid, and the Children’s Health Insurance Program (CHIP) by funding large-scale demonstrations sponsored by individual state governments. The theory behind SIM is that in addition to having regulatory and policy authority, state governments can create coalitions of stakeholders from every aspect of the health care system, across individuals, payers, providers, government, nonprofits, and health data aggregators. These coalitions will then design and implement State Health Innovation Plans (SHIP), meeting the specific needs of residents and building on projects already operating in each state. Through SIM, CMMI is hoping to demonstrate new financing and delivery models that spur reform beyond the services and programs used by Medicare, Medicaid, and CHIP beneficiaries and bring about comprehensive improvements in public health and the system as a whole. 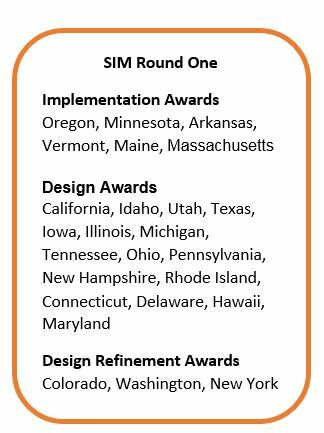 States with current SIM funding received awards in two rounds, announced in 2013 and 2014. In Round One, 25 states received a portion of nearly $300 million. Based on application criteria, SHIP models from six states secured implementation funding, 16 states were awarded dollars to design innovation models, and three states received money to further refine their models and resubmit. In Round Two, CMMI awarded over $660 million to 11 additional states, three territories, and the District of Columbia; representing 61 percent of the US population and over half the states in the nation. 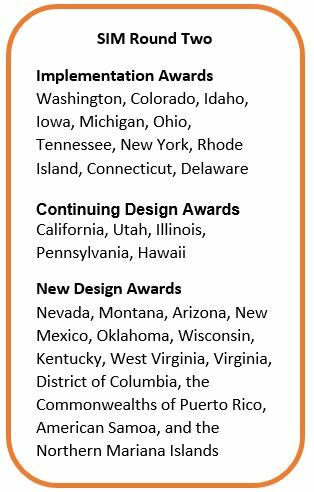 Eleven states moved from design to implementation awards, five received funding to continue designing previously submitted models, and 13 states and territories began designing SHIP models. Though guided by specific criteria, each state’s model is unique, crafted by stakeholders with detailed knowledge of the challenges inherent in their health care system. Each model has the core SIM elements of payment reform and care delivery redesign, and at the same time is tailored to the needs of the state. Per CMMI requirement, each Governor’s office sponsors their state SIM initiative. Players in Colorado’s health care system are known for their willingness to collaborate across sectors and industry silos. Designing the SIM model was no exception. Stakeholders from both the public and private sectors helped create the plan and draft the proposal; participating organizations included: the Governor’s Office, the Colorado Behavioral Healthcare Council, the Department of Health Care Policy and Financing (HCPF), the University of Colorado’s Department of Family Medicine, the Colorado Health Institute, and the Center for Improving Value in Health Care. In 2013, CMMI gave Colorado $2 million to develop the transformation model further, and then awarded an implementation grant in 2014. Between February 2015 and January 2019, Colorado will receive $65 million to put “The Colorado Framework” into place. finalizing a statewide plan to improve population health. The Framework establishes partnerships between the public health, behavioral health, and primary care sectors as more than 400 community mental health centers and primary care practices will come together to provide holistic, integrated care. Practice transformation and integrating care are not small endeavors for the state or the providers themselves. The Colorado Health Foundation awarded HCPF $3 million to be broken into competitive mini-grants to help participating practices develop innovative strategies that advance integration. Additionally, CMMI also awarded Colorado $11 million to participate in the Transforming Clinical Practice Initiative (TCPi), a program running concurrently with SIM and designed to provide technical assistance to clinicians and equip them the with tools, information, and network support needed to improve quality of care, increase patients’ access to information, and spend health care dollars more wisely. Stakeholders from across the state make up each workgroup, representing a wide array of perspectives and expertise. Indeed, inspiring and coordinating such varied voices is at once one of the biggest successes of SIM and one the greatest challenges it faces. This tool will contain 18 clinical quality measures appropriate to a practice and have reporting and extract capabilities. The collection and aggregation of clinical and behavioral health data will support clinical quality measurement data elements and value sets. The techniques developed in this focus area will be scalable for future use. All analytical reporting will be based on national standards and reporting for multiple users, including cohort practices will be available. Integration of clinical, behavioral health and claims data will provide the ability to analyze and report quality and cost measurements. The first component of the telehealth focus area is expanding broadband statewide so rural areas have access. Telehealth resource centers will engage patient and providers with technology that facilitates sharing information using nationally recognized interoperability standards. Formal evaluation of the Colorado Framework implementation began in January and while it is too early to produce measurable results, several successes can be reported. Multiple payers have decided on the alternative payment models to be used within the Colorado Framework and agreements are in place to provide value-based payment to participating practices. More than 180 practices applied to be part of the 100 practice first cohort and 17 organizations have committed to providing technical assistance to the participants. Four Community Health Centers received funding to integrate primary care into the behavioral health setting. The SIM Extension Service was established with the goal to place Regional Health Connectors in agencies across the state. These Connectors will coordinate efforts between providers, the public health system, and community resources. Broadband expanded to over 30 sites with the anticipation of a total expansion to 300 sites by the end of the program. Tools were developed to aid practices in data collection, aggregation, and analysis. As the Colorado Framework implementation moves into its third year, the groundwork laid by over 100 stakeholders begins to come to fruition. Exciting advances and innovations in the coming years will remake Colorado’s health care system and move the state closer the Triple Aim. Project Summary: As administrator of the CO APCD, CIVHC provides large data sets with up to 500 million records that enable SIM state and national evaluators, those organizations that are responsible for objectively measuring the trends in incremental value created by SIM innovations. In addition to big data, CIVHC provides complex analytics and data arrays as directed by the SIM Office and informed by the Evaluation Workgroup. As an example, CIVHC’s expert analysts developed and programmed the SIM primary care Patient Attribution Model that helps to identify over 3 million consumers with their primary care providers. In addition, CIVHC developed fifteen (15) claims-based clinical quality measures. These measures provide ongoing benchmarking and progress reporting, addressing health issues ranging from chronic conditions like diabetes and asthma to behavioral health concerns such as depression. This project demonstrates how claims data can augment other measures to provide actionable views for many populations in Colorado. Benefits to Colorado: CIVHC provides uniform data and analytics from the comprehensive CO APCD, allowing for better alignment of program evaluation processes and trend reporting. With CIVHC’s single SIM patient attribution method applied across the state, local improvement teams can compare their populations to help determine when SIM activities are effective in improving health and lowering costs. SIM clinical proxy measures provide performance trends in patient population health, and can bring attention to opportunities to improve evidence-based care. Proxy measures portray the clinical performances of SIM program participants compared with the larger Colorado population. In the diabetes testing measure shown, the early pre-intervention baseline comparison shows almost matching performance by both groups (73.4% vs. 72.3%). Over the four year SIM program, trends should show a growing performance difference between the SIM participants and the greater Colorado population. Improving the rate of these basic preventive services allow patients and providers to catch and treat complications early, and can have enormous impacts on individual lives and community health.